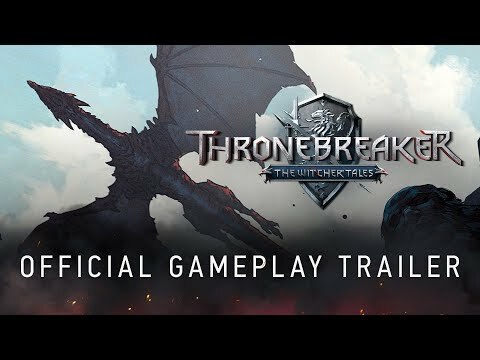 Thronebreaker is a single player role-playing game set in the world of The Witcher that combines narrative-driven exploration with unique puzzles and card battle mechanics. Crafted by the developers responsible for some of the most iconic moments in The Witcher 3: Wild Hunt, the game spins a truly regal tale of Meve, a war-veteran queen of two Northern Realms — Lyria and Rivia. Facing an imminent Nilfgaardian invasion, Meve is forced to once again enter the warpath, and set out on a dark journey of destruction and revenge. Throughout the adventure, players will explore new and never-before-seen parts of The Witcher world, embark on thought-provoking quests featuring rich, multidimensional characters. All while gathering resources to expand their army and engaging in epic story battles powered by the skill-based battle system known from Gwent: The Witcher Card Game. Thronebreaker: The Witcher Tales was released on PS4 and Xbox One 135d ago in the US and the UK. Notify me when Thronebreaker: The Witcher Tales is available. Based on 1 Thronebreaker: The Witcher Tales review, Thronebreaker: The Witcher Tales gets an average review score of 94.